The first time I heard the term â€œworking a room,â€� I thought there must be more to attending events than just showing up and simply interacting with others. Perhaps there is an actual science to â€œworking a room.â€� The fact is some people are more comfortable than others in social settings, and some people are so good at networking that they actually do have it down to a science. One such person is the man who got me started networking â€“ retired financial services industry executive Richard J. DeAgazio and now Principal of consulting firm Ironsides Associates. I saw Richard speak on â€œHow to Work a Roomâ€� at a Northeastern University Alumni event years ago, and immediately knew Richard was a networking pro. Not only did he have excellent networking tips, but I was also impressed with his major power presence, contacts, and ability to motivate others. Given his impressive skills, I thought I would interview him to share some of his advice. In any business, no matter what the profession is, social skills and networking are necessary to move forward. One way to network is to attend social events, because they bring together like-minded individuals, whether it is a church event, a charity event, or a professional association event. 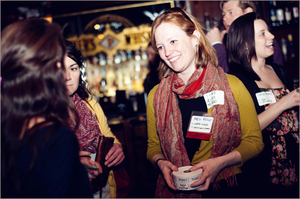 What Can Someone Who Isnâ€™t a Natural Networker Do To Make the Most Out of Attending an Event? Be prepared and determine the networking goal beforehand, such as who do you want to meet. This maximizes the time spent at the event to get the most out of it. Before attending the event, obtain the guest list if possible. This can be accomplished by asking the event coordinator if the guest list is available. If You Want to Meet A Specific Person, What is the Best Way to Do That? The key is to be as casual as possible. People do not like to be targeted. It is perfectly appropriate to introduce yourself to someone you donâ€™t know, but an even better way is to connect through an introduction if possible. If you see that someone you know is speaking with a person you want to meet, wait until the conversation breaks and then say hello. The person you know will likely introduce you to the person you want to know, and then you have an endorsed introduction. It is a networkerâ€™s job to introduce and connect others, and networkers should look to connect others with similar interests. The introducer benefits, as they become an integral part of the relationships they connect. What Should You Say and Do When Meeting Someone for the First Time? Be a good listener. Thereâ€™s something to the saying â€œhe who speaks last loses.â€� Not only is it impolite to interrupt others, but active listening facilitates follow-up questions and creates better dialogue. More effective conversation can happen by repeating back something a person says in the form of another question. What is the Best Way to End a Conversation? Have an ingoing and an outgoing pocket for business cards. This makes the business card exchange process fluent, but be careful not to put someone elseâ€™s card in the outgoing pocket. Name badges are very important. They should be worn in a prominent place for others to see, such as the upper right lapel of a jacket and should not be placed low such as on a belt. Proper name badge placement helps others get through awkward situations, as it allows them to quickly see your name, especially if they have met you before and donâ€™t recall your name. Name badges also help others to find you. Events are not places to do business, but it is perfectly appropriate to make arrangements for future conversation. If you want to meet the guest speaker, approach them before the event. Most guest speakers are approached by the crowd after they speak, and then you will be competing for their time. Ellen Keiley is a Boston World Partnerships Connector, a member of the Business Development Department in international law firm K&L Gatesâ€™ Boston office, and serves on the National Association of Women MBAs Boston Chapter Board of Directors. She can be contacted at ellen.keiley@klgates.com. Richard J. DeAgazio is the former President of Boston Capital Securities, Inc., a FINRA-registered broker dealer and an affiliate of Boston Capital Corp. Recently retired, he formed Ironsides Associates to be a consulting firm specializing in networking and relationship development. He speaks regularly about networking and how to connect to people, in their personal and business lives. Richard can be contacted at info@ironsidesassociates.com.